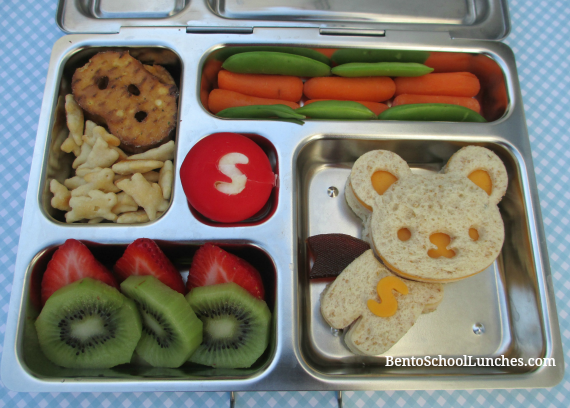 This Superbear bento was inspired by an Under Armour Superman shirt which we purchased for Nikolai recently. They have several cool action heroes shirts to chose from, but this time he preferred Superman. I used our CuteZCute cuddle palz to create the bear, the alphabet S from my alphabet cookie cutter set and free hand cut the cape from fruit leather. This lunch was packed in a Planetbox rover. Have a great Friday and weekend, everyone! Main compartment - Super Bear sandwich. Upper left - Pretzel crisps and Annie's organic cheddar bunnies. Lower left - Organic kiwi slices and strawberry. Upper right - Organic snap peas and baby carrots. Super cute lunch!! I am sure your son loved it! Great idea, super cute super lunch! This is so so cute and very creative! Love it!